Do you have any reaction? The therapeutic use of a medicine or vaccine is based on criteria of efficacy, quality and safety, considered from the perspective of benefit / risk. In general, medicines and vaccines are safe when their risks are considered acceptable in relation to the prophylactic and therapeutic benefit they provide, that is, when the pattern of adverse reactions is tolerable. Pharmacovigilance is defined as activities related to the detection, evaluation, understanding and prevention of adverse events, suspected adverse reactions, adverse reactions, events supposedly attributable to vaccination or immunization, or any other safety-related problem. the use of medications and vaccines. “NORMA Oficial Mexicana NOM-220-SSA1-2016”, Installation and operation of pharmacovigilance. At Ultra Laboratories SA de CV we are committed to our customers, distributors, authorities and the final user of our medicines, and since October 2009 we have the Pharmacovigilance Unit, through which, in Ultra we develop and promote activities that have as a purpose to promote the use of drugs in a safe, rational and more effective way (including cost-effectiveness). 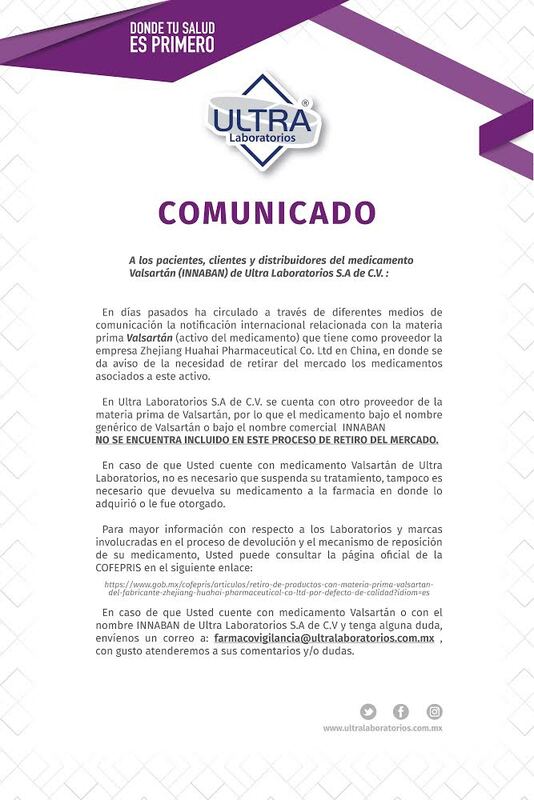 It is essential to have collaboration and joint work to achieve results for the benefit of Mexico and the countries where Ultra Laboratorios SA de CV distributes its medicines, Pharmacovigilance we are all, pharmaceutical industry, distributors, authorities, health personnel and the patient or final user, it is through the report of the suspicions of adverse reactions that we will be able to obtain the necessary elements to make an adequate risk-benefit balance in the use of medicines. We are a 100% Mexican pharmaceutical company, founded in 2001. Characterized by its vision and spirit of innovation. We have a strong Research and Development Department.